Talk about flexible space! Boogiezone Utopia - Laboratory for the Creative Arts is situated in Old Town Torrance. 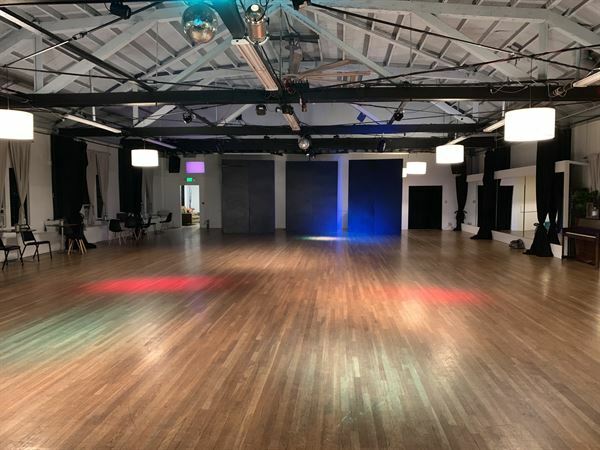 This 14,000 square foot gem will create the perfect scene to help stimulate your next creative project or provide the atmosphere you need for any private event of function. Perfect for photo shoots, film projects, workshops, private and company events, receptions, banquets, parties, art and fashion shows, and more! Short or long term rental options are available 7 days a week. Contact us now for rates or a guided tour! 13.5' x 32' 432 Square Feet • The Rooms are fully equipped with mirrors, a pitch control, CD player and iPod dock. • Portable ballet bars are available for request. Please select from various options: • Love Room - up to 15 guests Rates:	• Regular - $30 per hour, Off/Peak Hour - $45 per hour Please review our attachment for more options. Growth (Green Room): 30'x18' - 540 Square Feet Dream (Blue Room): 34' x 22' - 748 Square Feet Passion (Red Room): 35' x22' - 770 Square Feet • All Rooms are fully equipped with mirrors, Stereo Sound • Portable ballet bars are available for request. Please select from various options: • Growth Room • Dream Room • Passion Room Rates:	• Regular - $40 per hour, $55 off/peak hour Please review our attachment for more options. 26' x 15' + 15' x 5.5 473 Square Feet • The Rooms are fully equipped with mirror and sound. • Portable ballet bars are available for request. Do you have your own martial arts school, you can use our mats, bags, and equipment! This room has its own private bathroom. Please select from various options: • Fury Studio - up to 15 guests Rates:	• Regular - $30 per hour, Off/Peak Hour - $45 per hour Please review our attachment for more options. 27' x 44.5' 957 Square Feet It is fully equipped with mirrors and state of the art sound system. It accommodates up to 20-25 people Rates:	• Regular - $60 per hour • Off Hours - $75 per hour Please review our attachment for more options. 44.5' x 72.5' 3226 Square Feet. It is a ballroom with beautiful white oak floors and vaulted ceilings with exposed truss system. It is equipped with mirrors on 2 walls, a surround sound audio system and iPod dock. Disco Lights, Par Cans for performances. Small Kitchen with Sink/Fridge/Microwave accessible. Rates:	• Regular - $110 per hour • Peak/Off Hours - $125 per hour Please review our attachment for more options.